Guests at the September 2010 ribbon cutting for the new offices, in a remodeled doctor’s clinic, remarked at the bright, spacious offices and classrooms. But the bare property outside the building left much to be desired. Two months later, however, Mercy Housing’s sparse landscape was well on its way to looking like “a green oasis in an impervious desert,” according to Gene Peters. Peters is a local landscape designer who presented MHHD with a Sustainable Garden Master Plan and whose company did the installation. The “desert” he refers to had included the agency’s own cement parking lot. It still includes on all sides the cement paving at neighboring businesses, two adjacent streets, and the asphalt parking lot of a strip mall. In part, the agency’s landscape construction involved removal of a cement driveway and the laying of pervious paving tiles in its place. Now when it rains, the water soaks through the tiles into the ground instead of draining off into the street. Rain water also drains from MHHD’s roof, and it is saved in rain barrels for later watering. 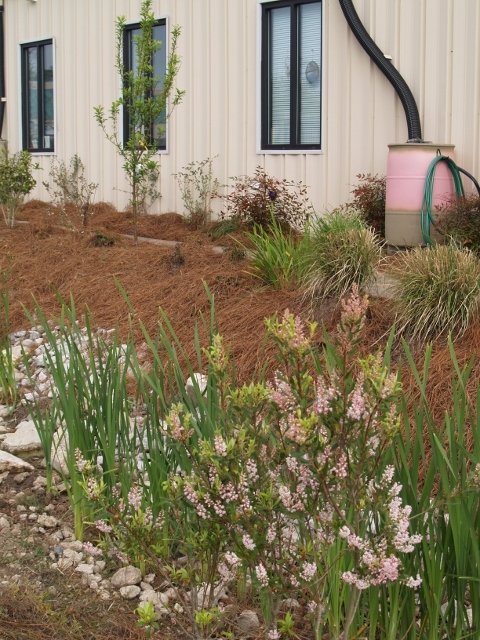 Mulching with a thick layer of pine needles helps to hold moisture in the soil, benefitting the plants and saving on the cost of city water during periods of drought. How growing fruits and vegetables can help save money on their food budgets. Gary Bachman, Ph.D., GRP, from Mississippi State University’s Coastal Research and Extension Center, is a guest speaker when Mercy Housing conducts its class on Basic Landscaping and Home Gardening. Dr. Bachman is a research professor of horticulture. He hosts “Southern Gardening” on WLOX TV 13 in Biloxi, and he writes a monthly column for “Mississippi Gardening” magazine. Mercy Housing funded the first phase of the Sustainable Garden Master Plan from existing investments. And, thanks to a grant from the Kresge Foundation, the agency will continue to maintain the native landscape plants and eco-friendly landscape elements.